We are in the home stretch of the busy spring season. Days end as fast as they start. School is winding down so there are a lot of events going on at the schools and soccer is slowing winding down as well. Sydney has one more regular season game and then a end of season tournament. 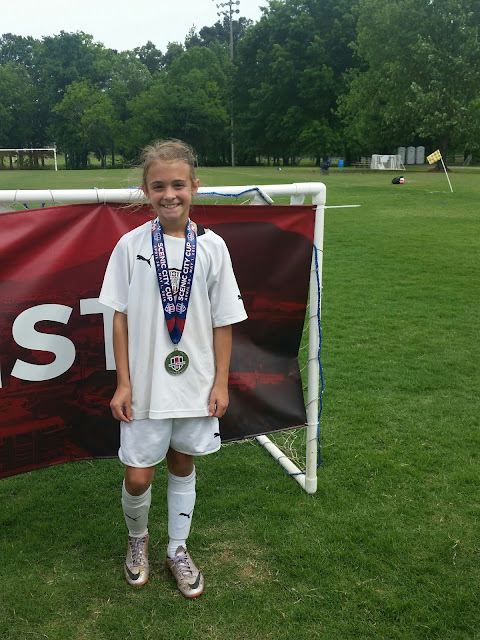 The end of April, beginning of May weekend brought an end of season tournament for Jordyn. This was an exciting experience for Jordyn because it was her first overnight tournament. We traveled to Chattanooga, TN for the Scenic City Cup. The weather could have been better, but it didn't stop our girls from playing some awesome soccer. Jordyn's team has 24 girls on it, which is broken down into smaller teams: white, red and gold. Jordyn played on the red team and they ended up earning the silver medal. 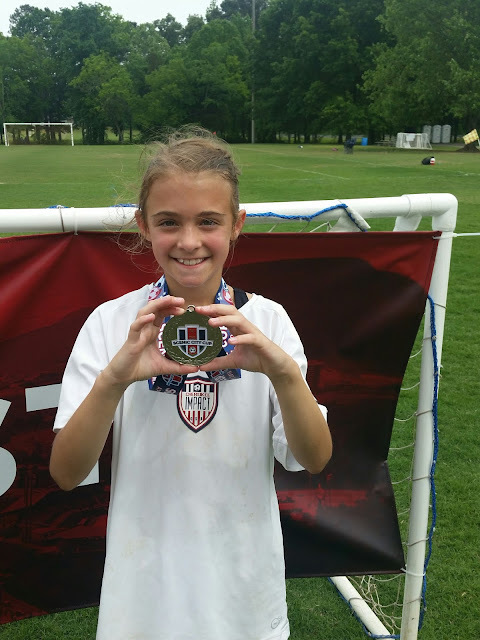 This was Jordyn's first official soccer medal so she was pretty pumped. Her team played some fantastic soccer. 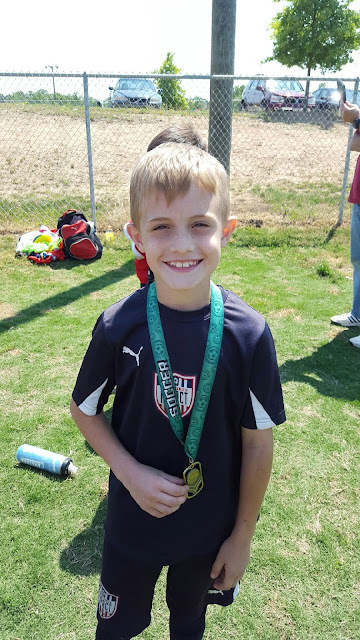 Jordyn scored a goal and even played keeper for half of one game. She had some AMAZING saves! I was so proud of her since this is not a position she has much experience with. I have to note that the white team played some fantastic games and the gold team won their bracket taking home a gold medal. Nice job to the entire u10 team! Look at my girl. She is gettin' it! Bryce's season came to a close this past weekend. He ended up having a a game on Thursday of last week and 2 games on Saturday. I got to watch Bryce's first game on Saturday before heading out of town with Sydney. I didn't get to see his last game of the season, but I heard his team played some great. This was Bryce's last season being able to play pre-academy as he is aging out of the program. So now he either plays rec or tryout for academy. Huge difference in the commitment and amount of money we spend between the two. Decisions, decisions. Jordyn also played her last game of the season on Saturday. Her team beat Alpharetta Ambush 6 to 1. Jordyn scored a goal and had a few assists. Not a bad way to end a season. While Bryce and Jordyn finished up their seasons Sydney and I made the long drive to Tifton, GA for a regular season game. That is one seriously boring drive!! The girls won the Saturday game 3 to 0. Sydney helped a killer cross by Lauren find it's way into the goal. Always exciting to see! After the game in Tifton we hopped back in the car and drove North to Warner Robins where we stayed for the night to get ready for another regular season game. Sadly this game ended in a loss. The final score was 2 to 1 and honestly it should have ended in a tie. The line ref missed an off sides call that resulted in the other team scoring. It's always tough to loose a game due to a missed call by a ref, but what can you do?! Y'all...look at how long the grass...I mean weeds were. Whaat?! After licking our wounds from the loss we jumped in the car and made the drive back home. We stopped by my mom's house for a little Mother's Day cookout with my peoples. We had ourselves a fun time since everyone was in a silly mood. Bryan wasn't able to make it because he was coaching beach volleyball in Gulf Shores all weekend. He didn't even get home until 11:30 Sunday night. We were scattered all over the place this weekend and felt like some family time was needed so tonight we skipped the last FFW (fast footwork) of the season and went to dinner instead. The rest of this week is jam packed with award ceremonies, field days, soccer practices and soccer evaluations, which take us into a busy weekend! My babies. I love them so big.